1. Decongest Your Chest The most common use of Vicks is to decongest your chest and throat area. When applied to the upper chest, it provides excellent relief of cough and congestion symptoms. 2. On Your Tootsies Applying Vicks to your feet provides nighttime cough relief. Generously rub VapoRub all over your feet and cover them with socks. Your cough will subside. 3. Achy Breaky Muscles Vicks relieves sore, overworked muscles. It increases circulation and provides almost instant aid. Use a generous portion and apply it over the aching area. 4. Get Rid of Nasty Nail Fungus Rub VapoRub on your toenails if you suspect you have a fungus. Within days, the nail will turn dark—this means the Vicks is killing the fungus. As your toenail grows out, the dark part will grow off and you will have fungus-free feet. Keep applying the ointment over a period of two weeks to fully cleanse nail beds of any remaining bacteria. 5. Stop Your Cat from Scratching To prevent Miss Kitty from ruining your doors, walls, and windows, apply a small amount of VapoRub to these areas. Cats detest the smell and will steer clear. Vicks can also be applied to your arms and legs if your kitty is prone to scratching you. 6. Pet Pee-Pee Deterrent If your dog or cat is not yet potty trained, put an open bottle of Vicks on the area he or she likes to mark as their territory. The smell will discourage them from lifting their legs and wetting your rug. 7. Headaches Be Gone Rub a small amount of Vicks VapoRub on your temples and forehead to help relieve headaches. The mentholated scent will release pressure in your head and instantly relieve pain. 8. 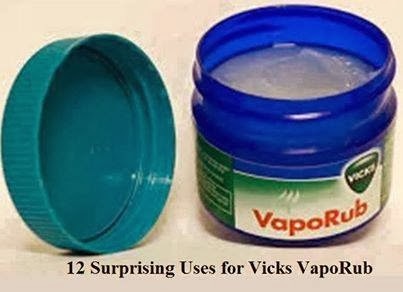 Humidify Your Sleep Vicks VapoRub can be used in special types of humidifiers and vaporizers. Ensure your humidifier has an aromatherapy compartment before using. The humidifier will circulate Vicks throughout the air and keep you breathing easy all night long. 9. Paper Cuts and Splinters To prevent infection and speed up healing time, dab a small amount of Vicks on any small cut or splinter. 10. Ticks and Bugs If you get bitten by a tick, apply Vicks immediately. The strong odor might help get the critter to release itself and stop bugging you. 11. Reek-free Racehorses Professional racers smother VapoRub under the nostrils of racehorses on race day. The strong stench deters the stallions from the alluring odor of the female pony and keeps them focused on the race. 12. Go Away Mosquitoes Apply small dabs of Vicks VapoRub to your skin and clothes and mosquitoes will steer clear. If you do get bitten, apply Vicks to the area and cover it with a Band-Aid to relieve itching.